Harold has completed his chores for the day - or has he? He is getting ready for a date while Albert busies himself recharging used batteries in the oven. Albert suggests Harold invites Roxanne home for her dinner - which he does. Albert baits Harold throughout - reinforcing that they are better off without 'birds'. Harold becomes angrier and angrier until his disappointment and frustration erupt and he wrecks the dinner table. During this outburst there is a knock at the door. Harold answers and, after telling her she is late, angrily shoves a plate of rescued fish and chips at Roxanne. Slamming the door in her face, he tells her to go away. He turns the clock back to the correct time: 7.25pm. This is a very densely packed episode which reveals a great deal about the characters, fleshing them out in full. The shock you feel when you see the lengths Albert will go to keep things as they are is very powerful and extremely rare in situation comedy. 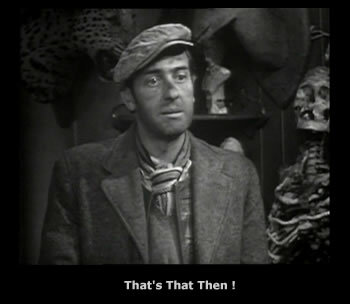 But then, Steptoe and Son is no ordinary sitcom. 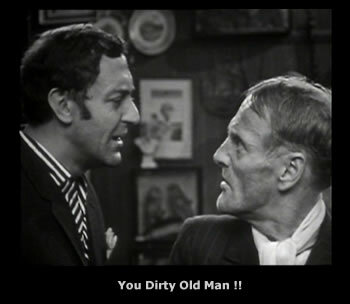 Buy this DVD and find out just how wicked the old man can be.